Top French perfumer Dominique Preyssas from fragrance house CPL Aromas in Paris has centered his Jaguar Classic Amber composition around a, particularly fine amber tone. For the top notes, he chose the fresh essences of grapefruit, mandarin, petit grain and pink pepper, while the middle notes are based on seductive aromas of apple, cinnamon, elemi resin, black pepper and orange blossoms. In the base notes, refined amber is complemented by cedarwood, patchouli, vanilla, leather, vetiver, labdanum, and musk. 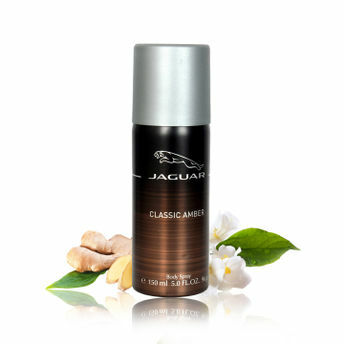 Classic Amber Deodorant by Jaguar keeps you smelling great all day long.Ideal for all occasions.